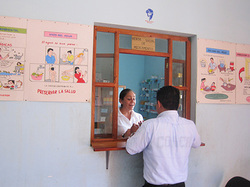 The San Guillermo health clinic is operated within the parish facility and is open to the public. The Friends of Esquipulas supports the salary of the clinic doctor and help provide medicines and supplies. This clinic is open to anyone, not just members of the church. Medical attention and/or medicines are free to those who cannot afford to pay.